Mechanical Simulation has updated its vehicle dynamics simulation tools, releasing 2018.1 versions of CarSim, TruckSim, and BikeSim. Departing from its usual yearly release schedule, this release comes just seven months after the previous major update of the packages in December 2017. The difference is that the focus for the simulation software is no longer just vehicle dynamics, as customers are increasingly wanting to incorporate validation of controllers for ADAS (advanced driver assistance systems) and autonomous driving in progressively more complicated scenarios. Such simulations must include more vehicles, operating under a wider range of conditions, and with more interactions between the subject vehicle and pedestrians and other vehicles. In past applications, according to Mechanical Simulation, a vehicle might be simulated a few thousand times to characterize dynamic behavior, replicating the physical tests usually carried out in closed proving grounds. All this means that in addition to vehicle math models and visualization tools, the simulation tools need to include multiple 3D road surfaces, other vehicles, and options for pedestrians and/or animals. The software packages have been extended to fill these needs, with many new animation resources such as walking pedestrians, moving cyclists and running animals, road surfaces and paint markings, road signs, and other features and potential hazards that appear along a road. These resources can be developed using a tool called VS Scene Builder (introduced in the previous 2018.0 versions), which can build scenes, with a ‘drag-and-drop’ function to locate paths and objects. 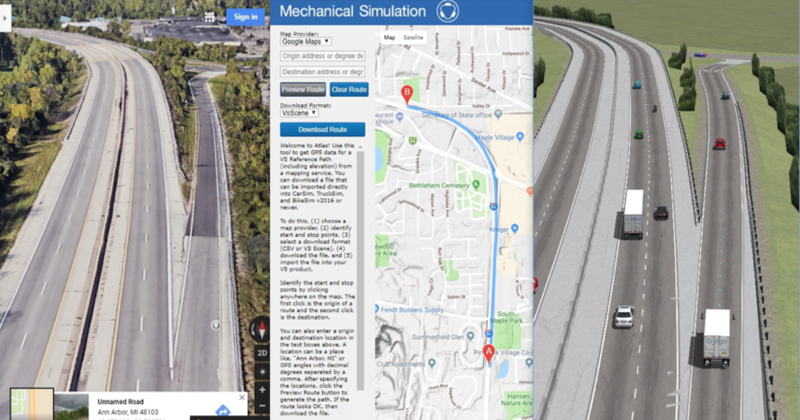 A web-based tool called Atlas can download GPS data from mapping services such as Google in order to simulate existing roads and intersections. For the 2018.1 release, Mechanical Simulation claims there are many improvements in the vehicle models, but that the improvements are perhaps more significant in the scenario-building tools and supporting resources. According to the company, new capabilities include: improvements in the Atlas tool to include GPS altitude along with latitude and longitude when downloading data; improved smoothing and editing of data when importing GPS data into CarSim, TruckSim and BikeSim; and software improvements in VS Scene Builder (undo/redo, dragging and dropping animator assets into the scene, access to global X-Y coordinates in scene). The shorter timescale for the introduction of 2018.1 is not an anomaly, as Sayers added that the rapid pace of ADAS development process and the need for ever-more powerful simulation systems means that the company will now be making major product releases at six-month intervals.